I devoured Livie's story much faster than I did Kacey's. Okay, it wasn't that much faster. 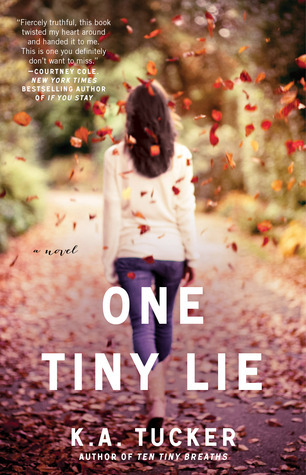 I finished One Tiny Lie in two days where Ten Tiny Breaths took me three. Still... it certainly seemed a lot faster to me. That being said, it's absolutely safe to say that if you enjoyed Ten Tiny Breaths, you'll enjoy this one. In fact, I'll even say that I enjoyed this one slightly more than the first. This story picks up a few years after the first and is centered around Kacey's younger sister, Livie. While we do see glimpses of Kacey/Trent, they certainly don't steal the show from Livie. Normally, I don't know how I feel about another book (or show or movie, etc.) starting from a different perspective than that of the first book. However, I love it here! The Kacey/Trent story wrapped up in the first book, but everyone else was left wide open to have their story told. And K. A. Tucker is taking advantage of it and performing flawlessly! The next book in the series centers around Cain and I absolutely can't wait to read his story. I would say that it's official... K. A. Tucker is certainly on my list of favorite authors.